Health Fair Connections | When are they going to start approving vendors for the health fair? Do you know when I'm going to be approved or denied from the health fair? 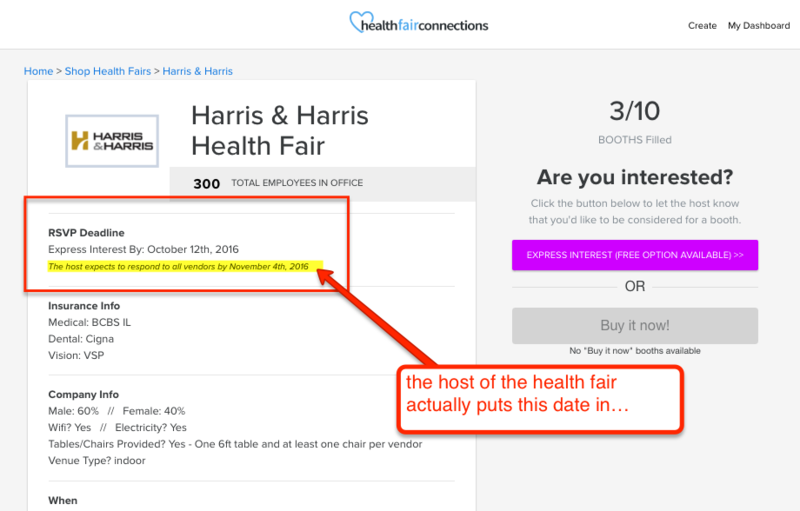 Health Fair Connections (HFC) takes strong measures to make sure the host lets you know whether you're approved or denied for their health fair in a timely fashion. However, all hosts are different. Some hosts are going to be more responsive than others. So, that's why we ask them for a concrete deadline as to when they will give a response to all vendors. That date is located on the health fair event page. Not only do they give us the deadline date, we remind them weekly they have vendors awaiting a response the moment you join the list of interested vendors. We'll also remind the host of the deadline as the date approaches. Try to be patient, and if you can't wait for the deadline due to a scheduling conflict, please back out of the health fair from your dashboard. Even with all those steps to ensure you receive a response, some hosts still leave vendors hanging. So, keep this in mind: If you do not receive a response within 7-10 days from the host, then do not plan on attending the health fair.